These heart shaped cookies are perfect gifts for Valentine’s Day! Kids love making and decorating cookies and will enjoy knowing that they have made these gifts themselves! 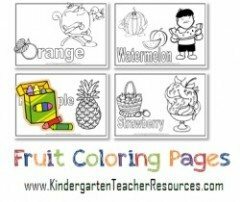 Each child can make a few cookies, wrap them up and write a nice card. A perfect gift to delight anyone! Hope you have as much fun making these cookies as we did! There are two different kinds of cookies: cookies that need to be baked and those that are baked before hand and only need to be decorated. You can make either kind depending on the facilities that you have available. If you are making these cookies at home then you will obviously have more options. 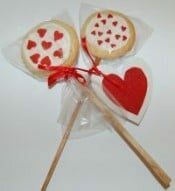 For those making the cookies in a day care, kindergarten, school, etc you can make the cookies ahead of time and just decorate them with the kids. There are a few kinds of cookies on this page so we will give a brief description on how to make each kind. Roll out the cookie dough and cut out round cookies. Make the dough relatively thick so that the cookies do not break. Insert a stick into each cookie and place on a baking tray. If you do not want to bake with the kids you can reach this stage before you involve the children. If you are making these cookies with a group of kids make a few extra cookies in case some break off the stick. Spread some white frosting on each cookie. Wait until the frosting hardens and then put each cookie in a cellophane bag. While you are waiting, cut out a heart shaped card and write a note to mom. Separate the cookie dough into two equal batches. Add red food paste coloring to half the batch and mix until the dough is red with no patches of color. Roll out the regular cookie dough and cut out a big heart and a few small hearts. 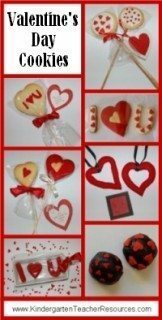 Roll out the red cookie dough and cut out a big heart and a few small hearts. You actually only need one small heart but it might take more than one try to insert the small heart cookie. If you have a few spares available it will be less frustrating. Cut a small heart out of each cookie and remove it from the big cookie. 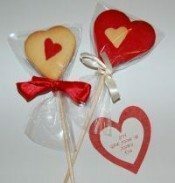 Gently push the small red heart in the white cookie and the small white heart in the red cookie. Put each cookie in a cellophane bag. Tie the red cookie with a white ribbon and the white cookie with a red ribbon. Cut out a heart shaped card. 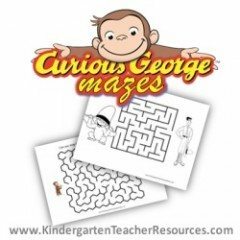 You can also write “mom” or “I love you” or use a cookie cutter to make any shape. Just use cookie cutter letters instead of heart shapes. Create heart shapes with cookie dough. We made a long sausage out of dough and joined it to form a heart shape. You can use a cookie cutter if you have two sizes. What is important is that you are able to insert ribbon. 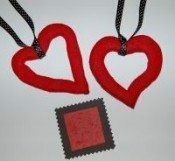 You can also just create a heart shape and make a hole at the top to insert the ribbon. If you do this then you can decorate the heart shaped cookie with frosting and candies. 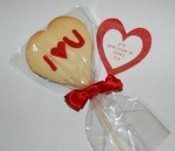 Tie the ribbon around the baked cookie and give to your valentine!